It doesn’t take long, really. Sadly, even. But someone can flick those side catches off your Jeep Wrangler’s hood and be off with your battery in about as much time as it took to type this sentence. Unhook, flip up, detach. Gone. Unfortunately, it is that simple. And for many new Jeep owners, well, they may not realize it at all. Some may say that is price of ownership. Just like a missing stereo, broken into glove box, or vandalized center console can be from time to time for a parked Jeep with no top. But that doesn’t make it any easier when you are headed out to work in the morning, only to find your Jeep is missing its heart. Or worse. Now, to be sure, this kind of situation is certainly not limited to one geographical area, but here in the Philadelphia region there have been 26 reports of stolen batteries over the past few months, and 22 of them have been from Jeep Wranglers. And overall, battery theft is up a whopping 41 percent this year in the city. While Bernard advised anyone owning a Jeep to get a dealership-installed lock to prevent theft, there are many other (and cheaper) options that work great to deter those looking to take your property. One of the most popular items for owners with a 2007 or newer Wrangler, is the Bolt Hood Lock. This accessory secures into existing holes behind the grille and can be programmed to work with your existing ignition key. Simple and cost efficient. 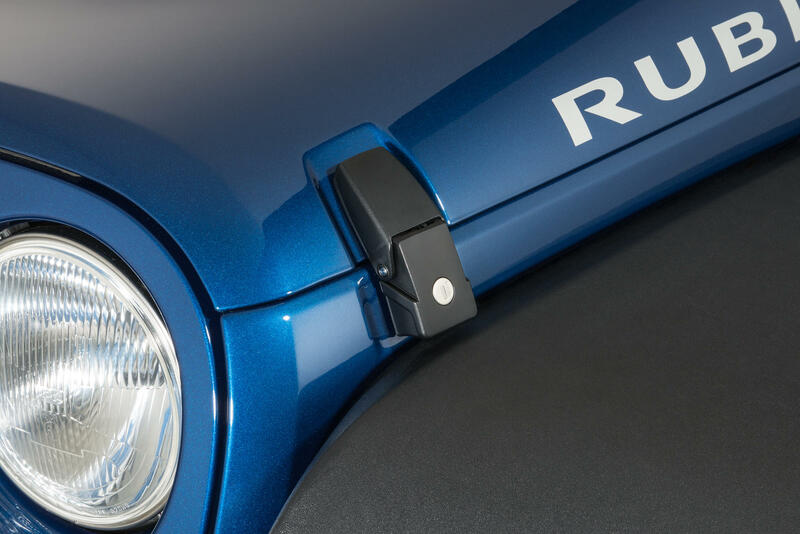 Other highly regarded hood lock products are ones made by Tuffy, Midwest Equipment, Rugged Ridge and Crown Automotive, and fit vehicles all the way back to 1972 CJ5s – so it’s not just the new Jeeps who get protection. If center mounted hood locks are not your thing, several companies also make replacement hood catches that are lockable to keep prying eyes away. These products are installed in place of your factory hood catches and either come in aluminum or stainless. For the newer Wrangler JK crowd, Rampage Products offers a stainless steel Locking Hood Catch Set in black, while Smittybilt, Omix and Drake Products all have options for TJ and JK Wranglers. All of these lockable accessories are relatively inexpensive, easy to install and definitely will provide you peace of mind night after night.